St. John’s River, located in Jacksonville, is the largest river in Florida and is considered a top-notch fishery. 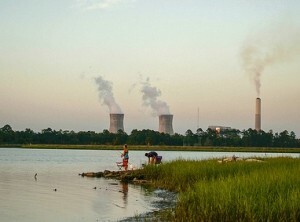 However, St. John’s River Power Park, located along the river, continues to threaten ecological and human health. In December, 2014, EPA released its long-awaited coal ash rule. EPA left enforcement of the rule to the utilities (and other owners) themselves, the states, and via citizen suits. But Florida has a troubling track record when it comes to protecting communicates from the dangers of coal ash. Florida is home to 15 coal-fired power plants and a total of 78 coal ash impoundments. According to the EPA Florida’s impoundments have enough capacity to hold 850 million gallons of coal ash, though due to utility underreporting that number is likely much higher. You can find each dumpsite’s capacity by clicking a power plant on the homepage and scrolling down to Power Plant Details and Maps. Annually, Florida’s power plants generate 6.1 million tons of coal ash making the state 7th in the nation for coal ash generation. With its porous geology and high water table, Florida is even more vulnerable to pollution from wastes stored in landfills and lagoons–which is why Florida law prohibits any hazardous waste landfills. Unfortunately, a new law passed in 2013 exempting coal ash dumps from this prohibition (please see “Legislation” section below). In Florida, 37% of reported coal ash landfills are unlined, 80% lack a leachate collection system, and even more are unmonitored and uncovered. Coal ash threatens Florida’s public health and the environment and the state’s $82 billion a year tourism industry. Toxic heavy metals in coal ash readily leach into water resources, and half of Florida’s power plants have already contaminated rivers, lakes streams and groundwater. Learn more about coal ash in Florida in Clean Water Fund’s report “Coal Ash: Florida’s Toxic Trash Exposed” and power plant-specific fact sheets. 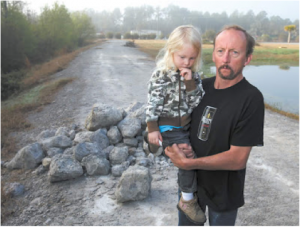 Florida resident, Steve Johnson, stands on his coal ash covered driveway with his daughter. Johnson was provided with several truckloads of EZBase for use on road construction without being warned of contamination threats. Now he and his family are left to deal with this toxic nightmare. Much of the coal ash produced each year is recycled and reused in different products. The Jacksonville Electric Authority is currently reusing coal ash by marketing it as “EZBase” to be used for road construction. The Florida Department of Environmental Protection (FDEP) has determined that EZBase can leach toxic materials to soil and water, causing contamination problems for several communities in Florida and beyond. The FDEP has required both the Jacksonville Electric Authority and property owners to remove EZBase from several locations. In May of 2013 Governor Scott approved SB 682: Fossil Fuel Combustion Products, which encourages coal ash reuse in applications that put it in direct contact with soil and water. Despite the fact that these uses are inappropriate and pose contamination threats, the bill also removes DEP oversight on these uses. The new law exempts coal ash from hazardous waste landfill restrictions, even though by definition coal ash is hazardous waste. Additionally, the bill allows utilities to sell coal ash for reuse for different products without adequate testing to see if any potential hazards to public health or the environment exist. Check out more information about coal ash in Florida and the EPA’s coal plant water pollution standards for the state.